Tensions run high in the D.C. region these days. The recent political transition has created uncertainty for federal workers and brought thousands of protesters into the streets, and all this lands on top of deepest winter and the other everyday stresses we all endure. Amid all this, one group of runners recently ran random acts of kindness through the city at the DC Capital Striders’ Random Acts of Kindness Run. Heather Rosso, 46, of Reston, inspired and led the event, which featured a route planned by DCCS President Rick Amernick. On Jan. 26, Rosso and nine friends met to run a three-mile route through the Shaw and Bloomingdale neighborhoods of D.C. 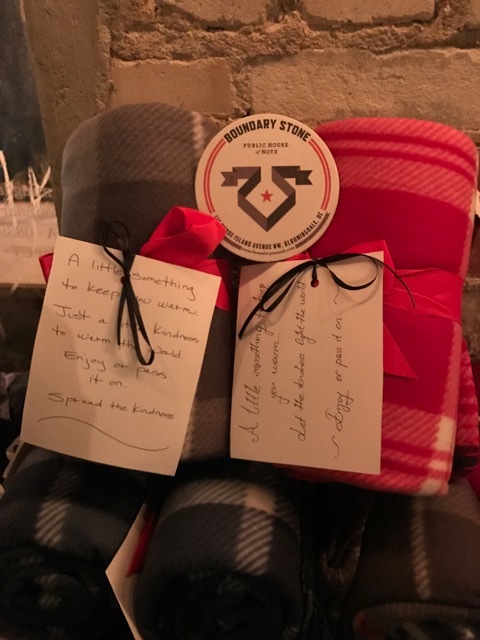 Along the way, they handed out more than 60 gifts–candy, toiletry packs, hats, gloves and even just kind words–to the people they encountered. Some they left out for passersby to find. “I don’t count them because, to me, it’s not about the gifts per se,” she said. “It’s about the kindness behind the gifts.” She wants to connect people with kind gestures, and the objects serve as an icebreaker above all. Rosso began randomly enacting kindness a few years ago on her birthday in keeping with her Buddhist faith. It was also part of a long recovery she made over eight years, after an injury led to an undiagnosed spinal infection, which in turn led to years of pain and a battle with depression. When she finally began to recover, she felt called to give something to others. In past years, Rosso and a smaller group of friends would give out gifts that she purchased near her home in Reston. “I have a knack for finding odd deals,” she admits. She has netted discounted winter gear before, and last year, she bought 45 flowers to hand out for her 45th birthday. This year, friends also gave money to buy gifts and gathered at her home to help pack them. Rosso is a longtime trail runner and member of DCCS and the Virginia Happy Trails Running Club, but it took Amernick’s encouragement for her to bring the two together. Her generosity came from her own pain and celebration, so the event was deeply personal. In addition, kindness is a small moment between people, and she is reluctant to lose that intimacy. But she was inviting her running friends anyway so they pushed forward. “Running makes it visible,” she realized as the night went on. The group, the speed and the spandex drew attention to what they were doing and allowed the runners to reach more people. That’s what she wants more than anything. Rosso envisions the RAK Run spreading to other clubs across the region and reaching people in more neighborhoods–kindness going viral, as she puts it. But for now she’s content to keep it to close friends and a birthday celebration. And people on the receiving end are still surprised by the gesture. For her, this is as much a reason as any to perform more kind gestures for the people she meets. But you do have to get past that initial awkwardness of approaching and interrupting strangers. Rosso laughs brightly at their attempts.